Below is a sample of regular customer feedback; open, read & enjoy. Apologies for the delay in sending this email but I honestly felt compelled to write and say thank you for helping us with our move from (Apartment in Liverpool City Center) to (House in Crosby Liverpool). The lads that came last Monday were brilliant – super efficient and very hard working – Chris and I were genuinely grateful for their help and assistance in the move. Everything from getting the quote right through to the last piece of furniture coming off the van has been great – completely professional. I will definitely recommend you to family and friends in future and we’ll be booking you for our next move, hopefully later this year. 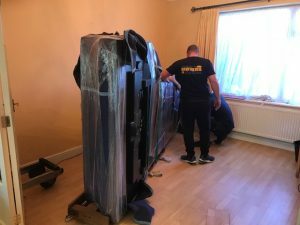 Apartment plus Grand Piano move in Liverpool, staying local to Merseyside. This is a great review we received this morning through Yell.com from a nice couple, Fyval & Kim. They moved out of an apartment with a lift from Waterloo, in Liverpool, into our storage warehouse for a few weeks, we then moved them to a second floor apartment with no lift, Grand Piano included up a very narrow staircase. and Patrick came out to see us, he advised how many boxes we needed and how many units for storage. 2 hours – we couldn’t quite believe how they did it in such a short time. 6 weeks later, we’ve just received all of our belongings back in the same perfect condition that we left them. change the date last minute – Patrick, Marie and John went out of their way to ensure that we got all our furniture back for Christmas! all of us at Merseyside Movers for Christmas and the New year. Another nice email received this morning from a local house move we did last week. Hi John, Just a quick thank you for the great service from your company on the day the lads were early and we weren’t completely ready after getting the boys ready for school and still boxing up. So after a quick brew the lads got stuck in, and they were brilliant all day, nothing was too much trouble. They knew what they were doing and they were very professional. Everything went in the correct rooms in the new house and the piano was handled with care and attention. I’d recommend you to anyone moving in the future. Lovely email received this morning Tuesday Sept 18th off a nice lady called Candice. Her move date changed a few times and I’m guessing she was pretty stressed by the time moved date was finally confirmed and our lads turned up. I’ve been meaning to email you. Everything went really well thank you. Your lads are a credit to your company. The removal men for our sellers were still at the house when we arrived and your lads stood out a mile with how tirelessly they worked getting everything in. They genuinely worked so hard and we were so pleased with their work. We are also grateful to you for fitting us in at such short notice. We will be recommending you to others. You are a great company. This is a review received from a good regular customer of ours, Mr John Davies and his wife Julie. We provided a full packing service on a couple of occasions, stored his furniture and belongings for a few months then delivered to his new property which had very narrow access so we could only use a very small vehicle to get up and down his long drive. Bit of a tester but all went well in the end. 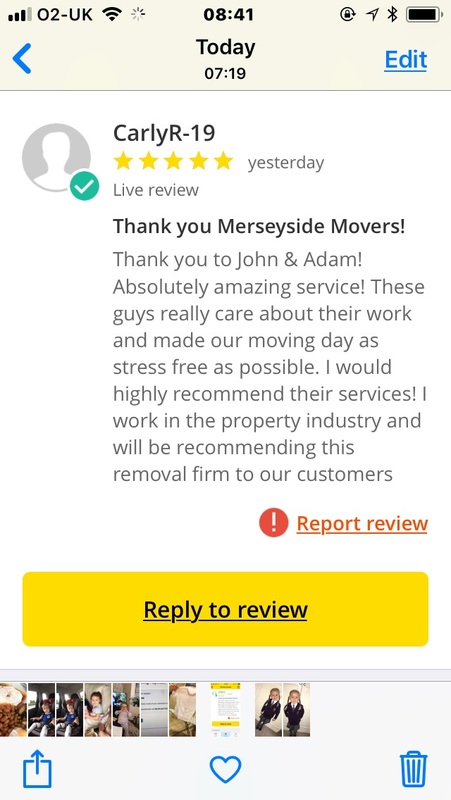 My feedback is: We have used the services of Merseyside Movers & Storers for many years. Always we have found them efficient, reliable, & trustworthy. Some of the Jobs have been indeed complex (baby grand piano into a third floor apartment). We have also used them for long-term storage of quality furniture during a major office relocation (all furniture was returned after 10 months in pristine condition). Our Thanks & Compliments to the Team. We would recommend them with confidence. Unfortunately the sale of the property for Mr & Mrs Stevenson did not complete on move day. All their furniture and belongings ended up staying in the removal truck over night parked up in our secure warehouse. With a bit of juggling around we managed to manage delivery the following afternoon after the sale completed and Mr & Mrs Stevenson eventually got the keys. Thank you very much for taking the time to email us Nicola, very best of luck to your parents in their new home, and any recommendations you could pass on to potential customers would be very much appreciated. I act on behalf of Mr and Mrs Stevenson for the move of Meldon close and Edgemoor on Monday (they are also my parents). I just wanted to say how fantastic your staff where who handled the move and are a real credit to your firm. You will note my area of law is conveyancing and I will be recommending your firm to any future clients. Another great review received yesterday. 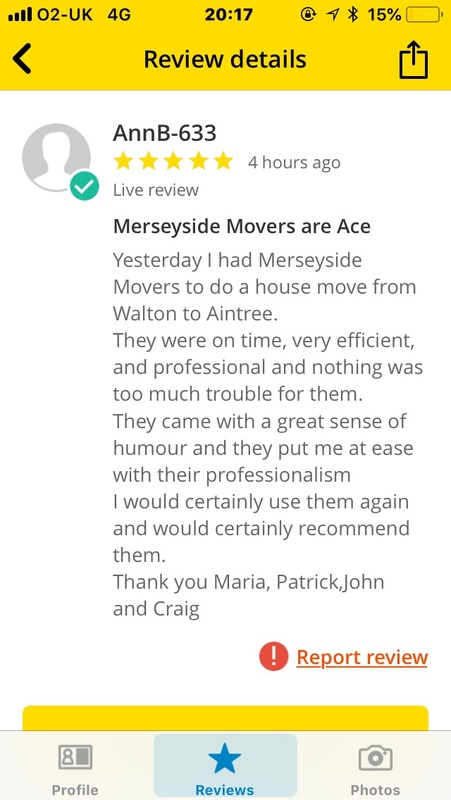 We moved a lovely lady called Anne from Walton, Liverpool to Aintree. Anne and her life long friend, Doreen decided to sell both there houses in the same street and had both lived in those houses all their lives, both ladies retired, one 68 and on 72 and both never moved house before. They bought a lovely 3 bed semi, had some renovation work done, had the garden landscaped and myself and Craig had the pleasure of moving Anne into the property. It was a pleasure as well, Anne and Doreen, if you happen to come across this, you are both inspirational, to get up and do what you have done, made your selves a lovely comfortable home to share and live the rest of your lives in together is fantastic and Myself and all the staff at Merseyside Movers wish you the very best of luck. Nice email sent to Patrick our surveyor this morning 05.06.2018. Thank you very much Carol for your fantastic feedback. Sorry to message you at the weekend but I wanted to pass on my thanks to you for organising such a successful move today. Frank and Paul were amazing – worked so hard, never complained and we had a laugh too. They were incredibly professional. It was great that the two other lads helped at the end of the day too. I am so pleased my neighbour recommended your company – I will certainly do the same. Frank must be a huge asset to you. I now need to pay! I’ll phone Marie on Monday and settle up. Another excellent review received this morning. Thank you so much Carly for taking the time to write this. All the very best of luck to you and Adam, Little Oliver plus the cats in your new home from all of us at Merseyside Movers. Nice email received this morning from a young lady called Sara she left this 5 star review on Google. Nice email from Lyndsay who is the daughter of Mrs Mc Queen the nice lady we moved today from Liverpool to Burscough. I had to take the french window out to get the very large sofa into the property, Lyndsay kindly posted this testimonial onto our company face book page. I moved in July from Widnes to the Wirral, I was extremely emotional as leaving my lovely home of 20 years and some amount of uncertainty about the move.. However the team of lads, Brian, Phil & Junior, were so supportive, understanding, patient and kind with their actions and words. I was so emotional and tearful. I couldn’t have wished for nicer lads they are a real credit to you. They remained professional throughout the move and absolutely nothing was any trouble to them. Thanks Merseyside Movers and a big massive thanks to you amazing 3 men. Wonderful! Review from a nice lady called Mrs Donavon. We moved her from her property in Aigburth into our storage warehouse. Than you very much Mrs Donavon for taking the time and the very best of luck when you get settled into your new home. Local house move Woolton staying local. This is a nice email we received from Mr Small who was a little stressed and frustrated after another company could not fit him in. Patrick called out to survey his move and the email tells you the rest. I just wanted to say thank you very much for Wednesday. It was a really difficult time for me and all your staff were wonderful! The guys on the day were amazing and didn’t bat an eyelid when a couple of things went wrong, they just sorted it out and got on with it. Local house move, 29.04.2017 Ormskirk staying in Ormskirk. Paul and Junior on a Saturday morning. Another very satisfied customer. My feedback is: I just want to pass on our thanks and praise to Paul and Junior who completed our home move. They were prompt, professional, courteous and quick. They are a real credit to Merseyside Movers and I have already recommended you to friends. Thank you Natalie for the kind words, very best of luck in your new home. A big thank you to the removal team, another professional job done. They provided a very punctual service – keeping both myself and the suppler updated on the timing and logistics of access. Everything was considered to avoid any issues. A freindly and professional service, many thanks . Thank you very much David for the business and taking the time to write this review. 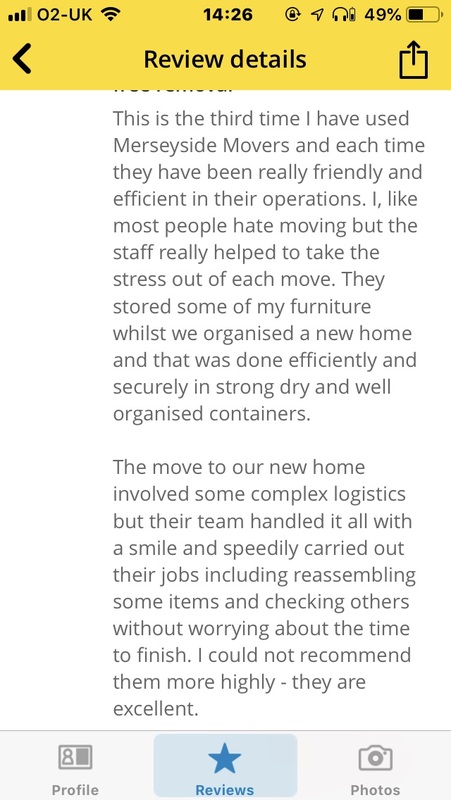 Nice email received from Mrs Studholme, We collected her furniture and goods from her house in Aigburth Liverpool, carefully wrapped and packed it into our storage containers and delivered into storage. Merseyside Movers and Storers was absolutely outstanding. I needed to put my stuff into store because I don’t have another house yet – and this is quite stressful. However, the removers carried and stacked my belongings with enormous care, which left me confident that they would use the same care when packing them into store. They just turned up – did the job with maximum efficiency – and left. I know that they will deliver my stuff with care when the time comes. Thoroughly recommended! I returned from holiday on the day I received this email. Great feedback from Mr Speakman, thank you very much for taking the time to write this, very best of luck to you in your new property. I just wanted to say how impressed I was with your service. Having spoken to the office in the morning, Patrick visited my house within 2 hours to complete a quick survey, within another 2 hours I had a written quote which I was happy to accept. On the day of the move the van turned up 45 minutes early, which was a good start to a busy day. Both Brian and Junior were excellent, nothing was too much trouble for them, the care and attention that they bestowed upon my belongings was second to none. I have just finished unpacking and I am pleased to say that nothing is missing or broken. It is very rare for me to give 10/10 but in this case I feel that it is thoroughly deserved. I am more than happy to recommend this company to family and friends. This is an email from a nice lady called Charu Bower who we moved from a 2 bed house in Croxteth Liverpool to Leicester. We were let down by Virgin. Only had our internet recently. David and I would like to thank you for the smooth removal you and your team did. I was stressed out until I saw you removal van. I would recommend your removal company to any one. Hope you had good journey back to Liverpool. Hi Patrick, I would just like to say the 4 guys you sent to move us on friday are an absolute credit to your company and if the rest of your guys work with the same gusto,enthusiasm and professionalism that these 4 show your are a very lucky man. I hope you give them a pat on the back from my wife and I. Regards and Thanks Les & Pat Speed. 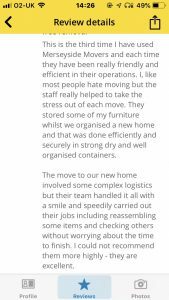 Local house move 28.04.2017 , staying in Liverpool, Fantastic feedback from Claire Morland. This was a local Liverpool house move that went a little pear shaped on the day, the people moving out of her house carried out their own move which took much longer than they probably thought it would take, hence our removal team, Paul, Craig and Ian had a long wait and couldn’t begin to unload until 5pm. The move was very stressful for our customers but from the feedback received from Claire, Our lads gave them the professional service they paid for. Thank you very much the team, Paul, Craig and Ian and thank you very much Claire and the very best of luck in your new home. However, one of the great saving graces was the choice of Merseyside Movers and Storers. Without the remarkable goodwill, zeal, commitment and organization, both beforehand and on the day, of the whole team we would never have got through it all. I do not give praise easily. On this occasion it was made very easy. Local house move in Runcorn, This move was booked in March 2017 by Janine to book a move for her Mum at quite short notice. Our lads again, Nathan and Junior provided an excellent service, that prompted this great feed back. Hi John, it’s janine (the lady who’s mum moved on Saturday). I just wanted to apologise about the job not being packed up, my mum pushed me to get it organised as soon as poss but didn’t pack properly for some strange reason. So I’m really sorry for that. I also just wanted to say thank you for all of your help and to let you know that the lads that moved what they could were absolutely amazing!! My mum couldn’t stop singing their praises. They were really lovely and careful, and amazing with my little brothers. So thank you again for everything, I will definitely be recommending you . > Can I commend your three people who did my move on Wednesday. I cannot fault any aspect of their work, it was a pleasure to have all my stuff transported to Cumbria by them. Nothing was any trouble to them, and I never heard a complaint from anyone. > They are a credit to your company, and I would not hesitate to recommend Merseyside Removers to anybody who requires your services. > Please convey my thanks to your lads, and I am delighted I chose a local firm than somebody who contacted me via the internet. > Once again many, many thanks for a job well done, and hope the closure of the A 66 didn’t cause any problems. I will let you know when I have a date for the next removal , it will probably in a few weeks. This was a small move we did for Mr Fisher, we provided a small packing service plus a move from an apartment in Liverpool to Essex. 2 man job, packed and loaded one day, delivered the following lunch time. My feedback is: Just wanted to say thank you for a great moving experience. The guys in the office were great and the removal guys themselves were brilliant: friendly and professional. A decent price in my opinion and made the whole move a lot less painful than it usually is. Thank you very much Mr Fisher for taking the time to write into us. I think we have moved Maria 4 times over the last few years, the first time was from Parlimant street Liverpool to our storage warehouse. Then up to St Helens and onto Sheffield this week. She has been a good customer and I thank her for her business and wish you all the luck in Yorkshire Maria. We also moved her niece Layla, from London back to Liverpool, then Liverpool back down South. Just to let you know… the guys that moved me yesterday were fabulous. They all went the extra mile to get my stuff in to the house. And yep it was the piano that was the BIGGEST problem. But they did it. So please could you thank them for me. Looking at living hear for at least 5yrs.. so may see you then. If this mail could find it way to the company management that would be great. Joanne and I would like to express our thanks to the three guys who help us move on Friday from Maghull to Lyidate. Their names were Nathan, Phil and Bryan Such friendly guys and worked so hard. They really did make our move so much easier and are a massive credit to you as a company. I would definitely recommend your firm to others and this is rare for me… I am usually miserable and have smoothing to complain about! My feedback is: A big thank you to all the team . 1st class job. Thanks again ! Sarah and Dan Misson were a little nervous and stressed out about there move up to Liverpool from Kingston upon Thames. I had several conversations with them both to re assure them that in choosing our company they were choosing a company they could rely on to carry out a full pack and move in a professional, polite and courteos manner. Which our removal teams do at all times. Here is Sarah’s email and Dans below. Thank you both for your business and kind words, We wish you all the luck in this great city we live in. Thanks again-we would definitely use your company again in the future/recommend to others who are moving. This move was carried out on a Saturday morning by Paul & Craig from the Norris Green area, Liverpool to Southport. Mr Zaidi and his wife were obviously very impressed with the service provided. Thank you Asher for your kind words and taking the time to email me the same day as the move. Hope everything went well on your daughter’s wedding. This was a move we did for a nice couple, Dawn & Jason Banks, they kept the teas & Coffees flowing for the day, even gave the team a couple of trays of beer to show how appreciative they were of the service provided. Absolutely brilliant. We couldn’t have asked for more with our move. All the lads including Nathan, Jay, Norman (who was the best of all) and John, worked hard for the whole day and were only too pleased to help with any problems that arose. They were all a credit to the company and I wouldn’t hesitate to use this company again, should I ever move again or recommend to my family and Friends. This email was from a very nice gentleman and his good lady wife, Mr & Mrs Barclay. It was a 2 day move from The Wirral to Devon. Best of luck Ian and thank you very much for the feedback. I would like to express my gratitude for your moving us from Wirral to Devon. The lads were exceptionally helpful, careful and cooperative both in leaving and arriving. Nothing was too much trouble down to removing doors off a heavy oak Dutch dresser. All in all it was most satisfactory. You and the lads were great and made the whole process as smooth as possible. I would have no hesitation in recommending your services to anyone looking to move home. I received this email on Feb 07th 2017. It was a short notice move, access at the new property wasn’t very good and we had to move the furniture from a wagon to a smaller vehicle to get down the narrow driveway. Sue, the customer was obviously very pleased. Would just like say we where very pleased with the service we received from your company. We certainly would recommend your company. Just a note to say a massive thanks to the lads that moved us on Thursday, they were brilliant, very professional, friendly and polite, they made a very stressful day much easier. We moved on 16.8.16 from a 2nd floor apartment to a house. I am unable to praise your staff enough from their efficiency to their politeness. The removal day was the easiest and most stress free day we had in a long time and that was down to your firm. I would definitely recommend you and have done to everyone I know. Your staff are a credit to your family run firm. I am sorry it’s taken me a while to e mail but I think it is important to let you know just how impressed we were with your company and staff. Cal and Craig are a credit to your business. They are very friendly, professional and have a great work ethic. Nothing was too much trouble to them and they went out of their way to ensure everything ran smoothly. I have moved twice in last 6 months using Merseyside Movers & Storers both times. The 3 guys Bryan, Nathan and Patrick were very professional, helpful, polite & well organised. The move was totally stress free and I would highly recommend using you. Just wanted to say a huge thank you for a ‘stress free’ move yesterday. From my initial enquires on a trusted website – your response was outstanding, initial phone call followed by a prompt house visit to receiving the quote – all within 2 days. Your guys yesterday were fabulous, nothing was too much trouble. They were polite, helpful and even dealt with the parking ‘hiccup’. I look forward to seeing them again on the return trip. Sorry not to have emailed before – we’re not long since getting back online! When we spoke, I also mentioned how delighted we were with the removal day. With 3 young children, it promised to be a pretty stressful day but your chaps arrived good and early and really enthusiastic and jolly. They were really lovely, genuinely made the day good fun and they absolutely worked their socks off. They are a real credit to you. We would, and will, recommend your firm to everyone. Thank you. Best wishes to you all for a great Christmas and New Year. I would like to say thank you to you and your colleagues for the excellent service we received last Friday. Our move was so stress free I could not believe it! Very professional, very organized and quick, we would definitely recommend your company to anyone who wants to move house. What a pleasure it was to have Merseyside Movers move our household effects from The Highlands of Scotland to Formby. John the manager dealt with our requirements very professionally and I was sorry not to see him doing the run. However both Paul and Craig were the best pair of removal men we could have asked for. I just wanted to say thank you so much for all your help with our house move. From the first visit from Patrick to us arriving in our new home everything was so organised and professional. 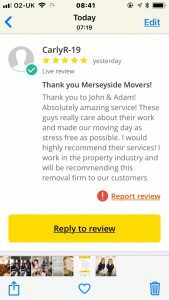 The men who helped us move were really efficient and friendly and I wouldn’t hesitate to recommend Merseyside Movers to anyone and can’t thank you enough. I’ve recently moved house and the movers could not get my couch in through the stairwell into my first floor apartment as it was too big! Gutted. The couch was under a year old, so I was not ready to get rid of it just yet. I researched various options and was eventually contacted by John at Merseyside Movers. We discussed the possibility of getting the couch in through my first floor window and John came to my house to check the access, and also agreed to collect the couch from where I was storing it. Just a note to say many thanks for organising a very smooth ‘move’ yesterday. The lads were very prompt, polite and efficient and my friend for whom I made the arrangements was very pleased with the arrangement. I recently moved my elderly parents up from Liverpool to Scotland. I researched number of removals companies and hit upon Merseyside Movers, based upon previous positive recommendations. From the word ‘go’ they were extremely friendly, professional and helpful. The removals guys on the day were top notch. Couldn’t fault them at all. Everything arrived safe and sound. They also put my parents at ease, given this was such a big move for them. Would recommend the company without hesitation. We would like to thank you and your team for the excellent service we had moving house 30/11/15. The weather was horrendous and we had a very long wait at the end for our keys, so it was a stressful time for us but it was all made much easier thanks to their professionalism and the speed at which they worked . Everyone was brilliant, nothing was too much trouble for them. You came highly recommended from friends and family who also had excellent service, and we are very pleased that we chose you. A huge thank you to you and your team, Craig, Cad and new lad Danny, who worked so hard and kept smiling and were so polite and friendly. The heat on Monday was off the scale but they were wonderful. We would heartily recommend your firm. Many thanks for Saturday – your lads did a great job and were courteous and supportive through the entire process. I would definitely recommend you to anyone who asks. I would just like to say a big thank you for all help with my move to 18 Cinema Drive everyone was so professional and helpful. Extremely pleased with my move. 2nd time used Merseyside Movers. Very helpful guys (even put my clothes in wardrobes!) Amazing service. Will definitely be using you again next year. Thank you for making move hassle free. I hope you did not have any problems getting back. Now the dust has settled after our move to Parkgate I just wanted to email you and thank your firm and the removal team for a 1st rate job. The “boys” (I am being generous with that term) turned up spot on time, worked like trojans to fill the vans. Nothing was too much trouble for them and they were very careful with all goods. After several brews the vans were filled and fortunately our keys were ready on-time. At our destination they again worked non-stop to unload our goods, making sure they were going in the right places. At all times they were very accommodating to any changes in our plans, and polite and friendly throughout the day. Thanks again, and I will have no hesitation in recommending you to friends or family who have a need for such a service. Just to let you know that Mark and Craig have just left, having delivered everything carefully and precisely, and in very good cheer. I assume it’s all here now! Anyway, I just wanted to say how grateful I am that we chose Merseyside Movers. You have been excellent, and you movers and drivers have been first rate. We had a complicated move, with a third of our furniture and boxes picked up for a long period of storage in Liverpool and the other two-thirds picked up in Liverpool and delivered to Leicester in one day. 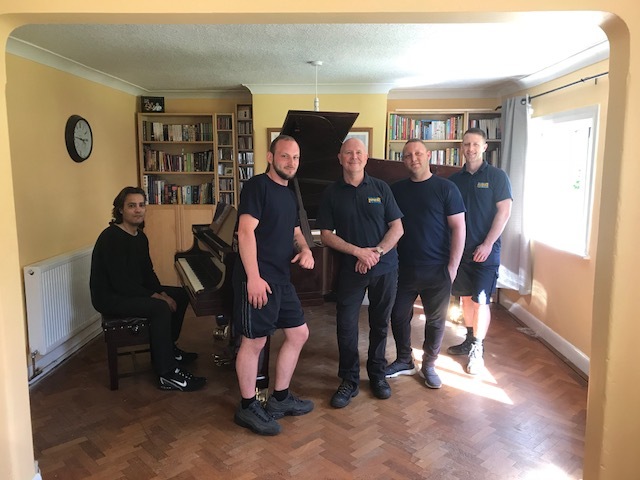 Twelve months later, with our house renovation nearly finished and all of our possessions back together, I am very glad we chose Merseyside Movers. From the initial assessment of our needs, through pick up and delivery, insurance and storage, they were excellent. The price was really competitive and the service was first rate. The movers themselves were skilled, professional and friendly. I would recommend Merseyside Movers to anyone. stuff!) They are an absolute credit to you and I will not hesitate to recommend this company. I will be writing a Google review over the weekend regarding our experience. Thank you once again and honestly, we are actually looking forward to moving my nan back in now. Just wanted to express my thanks for the removal executed by Craig and John yesterday, nothing was a problem to them, they were well mannered and extremely helpful, even when I realised I had packed all my mugs and they couldn’t have a cuppa they still laughed.But we did feed and water them when we all got to Leominster.They went off home with a tip and Kevin gave each of them a bottle of red wine, they were happy.Everything was done with great ease and I would have no problem in recommending your company if asked to do so without any hesitation. I want to thank you as well, even though you had your dear Mum to think about, you still took the time to call me on Sunday and check all was ok.Was sorry to hear Mum has lot her fight for life but I am sure you will have her in your heart and can remember the good times and keep the memories alive. Super service – thanks. All done with two days notice! I was impressed with the selection provided by reallymoving.com. I initially contacted another company who promised to call round to give a price then failed to call me back when I rang and asked them to confirm this. 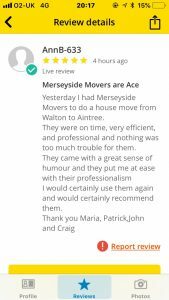 Merseyside Movers and Storers were excellent. Patrick contacted me following my reallymoving.com search offering to call round to look at how much we had to move and give a firm price. Having been let down by the other company I contacted Patrick only six days before my move date and he came round the same day. Despite having a massive amount to move the final price was only £30 more than the original quote. Everything went superbly well on the day and, when it was clear that the contents of our garage and sheds would not fit into the large removal vehicle, an extra van and two more men were sent. Everything was placed in the correct room and nothing was damaged. I have nothing but praise for this company and especially and the five men who worked so hard on the day. I would not hesitate to recommend them. From the moment Patrick contacted me after receiving my quote, I found him to be really helpful and courteous. In the lead up to our move, I only had to ring him and he provided extra packing cases etc. immediately. On the day of the move, his removal men were excellent and even helped me to pack things that I still hadn’t done. I wouldn’t hesitate to recommend Merseyside Movers to anyone. Merseyside Movers & Storers The service was excellent from start to finish, all members of staff where very helpful. I would most certainly recommend them. Good communication and helpful advice. On the day the movers were professional, courtious, resolved problems and speedy. I was grateful for their help and they made the whole move less stressful for me. The price is slightly underquoted on the website. This probably need to be agreed with the movers. John Owen & his employees were very friendly and caring. They made our move stress-free. We would call them when we move again. I would certainly recommend them to anyone moving home. Very helpful, friendly and reasonably priced compared to other companies. I would definitely use them again. I just wanted to drop you a note to say that the move went perfectly today thanks to you and your team. We were really impressed with the service throughout and wanted to say a big thank you. The guys we had with us today were top class – very friendly and professional – they worked so hard and were great fun. On Friday 13th March you moved furniture from my daughter’s house in Seaforth to Horsham, Sussex. I would like to thank you for the highly professional service that was experienced. I was at the Seaforth end and although there was difficulty getting a sofa out of the house all else went very smoothly. Norman and Brian were amazing and could not do enough to help and support at both ends. We have a family member who is due to move house shortly and I have past on your details and my comments to him. I will not hesitate to highly recommend your Company should I get the opportunity. Just a quick note to say another thank you to Craig and Simon for their hard work with our move on Friday. A super job with only a day’s notice! We will deffinately recommend you. I would just like to pass on our thanks for a very professional service today and say how impressed we were with Craig and Mark. They worked extremely hard under some difficult circumstances and managed to keep good humoured and patient throughout the day. I will definitely recommend your firm if any of our friends or family need a removal service. Merseyside Service was excellent, nothing was a problem for the two movers who executed my move, they were courteous, well mannered and very willing, although it was a long distance move of 114 miles they conducted themselves very well indeed. John Owen whom I dealt with at Merseyside Movers was very attentive and again he was always ready and willing to help, I had to have my window removed to get a settee out of the lounge and although I arranged this myself he and the company was very patient, also Johns wife Marie who does the admin in the office was very helpful as well. Very friendly, reliable and affordable! reallymoving.com was OK. Merseyside Movers were brilliant. Craig & Norman who carried out the job for us were excellent. Nothing was any trouble for them. All our stuff was packed excellently (protected and secured well in the van), moved carefully, and unpacked at the other end and placed exactly where we wanted it. Nothing went missing and nothing got damaged. Exactly what we were after and I would recommend the company to others. I thought the 2 lads sent by Patrick on the day were brill, they made what could have turned out to be a very stressful day a lot easier they couldn’t do enough for us, they were professional and very helpful, great lads and good company. Would definitely recommend this company. Good value for money. Good contact. Reliable and Friendly Company. Move completed in good time and with no breakages and complete confidence in the men who did our move. The removal team were very helpful, professional and friendly. They put the extra effort in to help our move go as smoothly as possible. I would definitely recommend them to friends and family and would use them again in the future if I were ever to move home again. Just a quick note to thank you and your team for the move on Monday. The team who moved us were extremely professional, helpful and pleasant; they helped make a very stressful day more bearable! Nothing was too much trouble for them and their humour kept our spirits up. 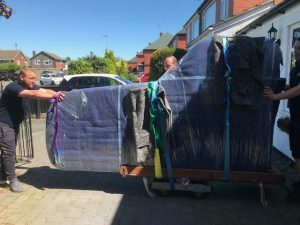 I would certainly recommend Merseyside Movers to anyone moving house; I would be more than happy to have my words used as a recommendation on your website etc. As promised just a few words that I would be happy for you to use as a testimonial. My partner and I would like to extend our thanks to Merseyside Movers for the excellent job they did on our recent move. The two Craig’s were excellent and ensured that all of our belongings were treated with the utmost care and respect. The move was stress and hassle free and made our new place feel like home so much faster than I ever expected. Moving to a very narrow street had its challenges for access but, they were extremely polite in organising a space to park their van and ensuring that they caused the minimal impact to other residence. We are loving our new home and cannot thank Merseyside Movers enough for making the process of moving a positive one. Could not recommend enough and the competitive price was just a bonus! I’d just like to send you a quick line to say how pleased we were with the service you provided. In spite of several on-off-on again dates you kept pencilling us in, until it really happened. On the day, the lads turned up early and put in a real shift for us. It was a very long day for all concerned and we’d like to go on record to express our thanks to them for all their hard work. I’d have no hesitation in recommending you to anyone who asks. Thank you for a professional and cheerful service – the two guys you send were fantastic and extremely patient with our 3 year old, who was very keen to assist them!!! Very good company. very pleased with the service and they were half the price of other companies. very good value for money. nice polite and hard working lads. no breakages or lost items. punctual and honest. “I thought the 2 lads sent by Patrick on the day were brill, they made what could have turned out to be a very stressful day a lot easier they couldn’t do enough for us, they were professional and very helpful, great lads and good company”.